An interesting piece in the Eye this week - a detailed analysis and breakdown of estate agency fees. The main conclusion is that the average fee, as expressed as a percentage of the sale price of the property, has fallen over the last four years. The full article is here, so we will concentrate on the aspect that we can influence: differentiation. 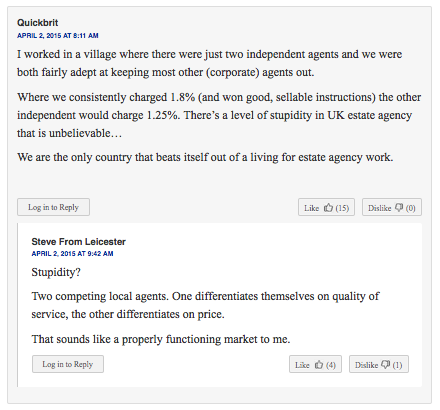 This is just one exchange out of the many the article prompted; the former is much more likely to be our client! And that is what Dialogue is all about. If it can enable our clients to gain just one more instruction and charge just one tenth of a percent more in fees, then it's more than paid for itself. If it does better than that, then everyone is in clover (if you missed the recent post about a new client's experience, read it here).